Join us each Friday from 12pm to 1.30pm in the Pastoral Centre for Lenten Lunch and help raise money for our Lenten charities. 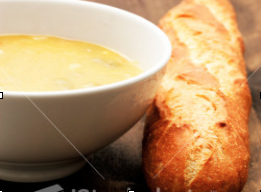 For just £5.50 enjoy a delicious bowl of homemade soup, lovely fresh bread and cheese, and good company. No need to book in advance. Come along on the day, and bring your friends. Proceeds will go towards our two Lenten charities – Bakhita House and Saints Peter and Paul Parish, Niger Delta. 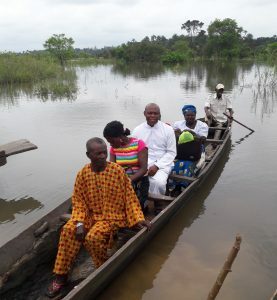 This Lent, we will be supporting the parish of SS Peter and Paul, Oyede, in the Delta State, Nigeria, to purchase a new boat. Oyede is a rural community of around ten thousand inhabitants, made up of eight farm stations. SS Peter and Paul Catholic Church is in the centre of the town. 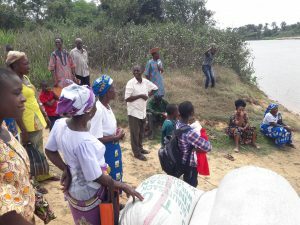 The majority of parishioners are farmers who must travel several kilometres each day, often crossing rivers, to reach their farms. Sadly, flooding during the rainy season has become more common. 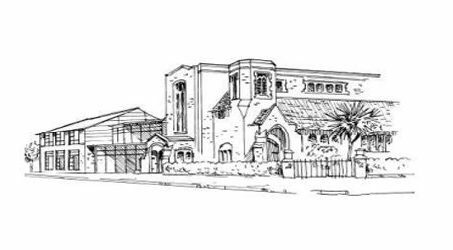 Many houses and farms became submerged last September and October, and affected parishioners came to the church for shelter until they were able to return to their homes. At the moment, we rely on boat transporters to reach the farm stations. Sometimes, they are not available and we cannot go to administer the sacraments to the farm stations. If we purchase a water boat, which will belong to the catholic community, it will be a big help to us and will enable us reach our sisters and brothers in the farm stations. Please give generously to our Lenten appeal, so that we may support Father Emeka and the community of Oyede.